Team enjoys unseasonably cool winter. Mission starts with training on D.A.N. Emergency Oxygen Case and OTS Full Face Mask in the pool. 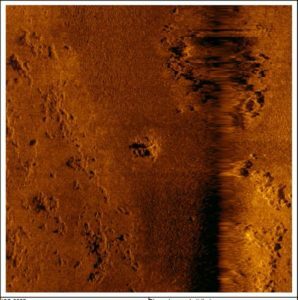 Members cover more ground and target verification due to the Navigator Sonar from Scripps and UDEL drastically changing the efficiency of the team’s efforts. Nothing of interest found on land or in sea and obvious land targets are running dry. 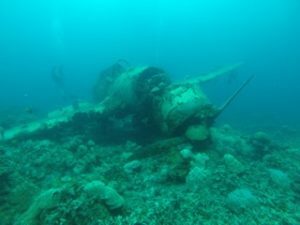 Old sites revisited for new members, corsair and B24. Sunken landing craft and land LTV’s visited. New records set for the team. 100 targets dived. 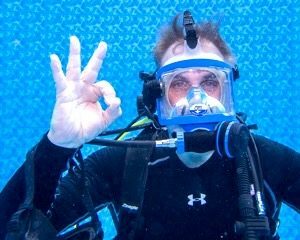 70 man hours underwater. 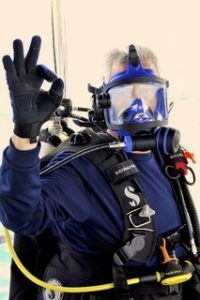 79 Feet Below Sea Water (FSW) average for all targets. Make sure to Check out Project Recover’s Facebook Page and Project Recover’s latest news. 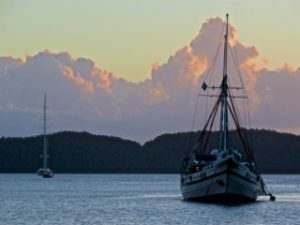 The 2016 expedition to Palau began on March 1 and is scheduled thru 15April. 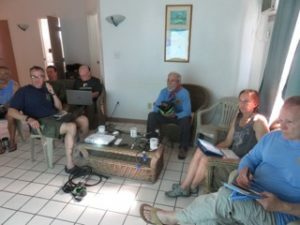 Participants include teams from the BentProp Project, SIO (Scripps Institute of Oceanography), and UDEL (University of Delaware) and archeology students from the University of Hawaii. 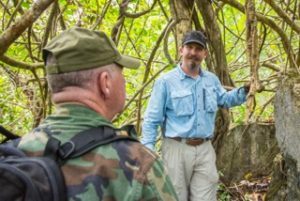 Search areas will include both land, mangrove and water targets. 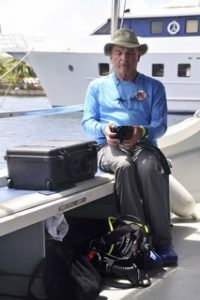 Dan O’Brien arrived yesterday in Palau, but I have no pictures yet from him. So all I can report is that he’s a happy camper sleeping in his usual bed in our usual hotel in Palau. I’ve been here two full days and I now have a little bit of quiet time in the morning to write something to everyone. It’s great to be back in Palau, seeing old friends and meeting new ones. We’ve been diving the past two days and I believe we will be diving for a few more until we do some land work. We have targeted both on land and water this year although it does appear we are water-centric. As you know from the first update, we have firmed up our relationships with the Scripps Institution of Oceanography (SIO) and The University of Delaware (UDEL). They came out here around March 1st and worked our target areas with their Autonomous Underwater Vehicles (AUV) and left before we actually arrived. They did a lot of ‘beam until you scream. 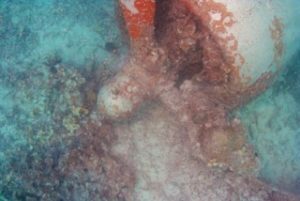 They developed a list of ‘interesting’ sea features that needed to be looked at. Now we are doing that. So far, we’ve seen a lot of rock, a couple of pieces of coral, and some harbor junk. But at least we know where not to look anymore! Drew Pietruszka, was the first of us to arrive and is dual-hatted. He also works for UDEL. He arrived March 7th. 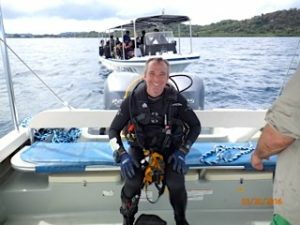 He is an underwater archaeologist, used to work for DPAA (The new JPAC) and is now offering a hand to us. Dan O’Brien arrived on the 9th. If you read his texts and emails while traveling here you’ll know that he got as far as Fresno before running into travel problems getting out to the Pacific. 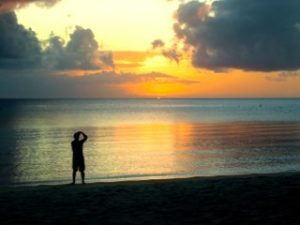 After four different airline connections fell through, he arrived in Guam roughly 8 hours late. Not too bad. 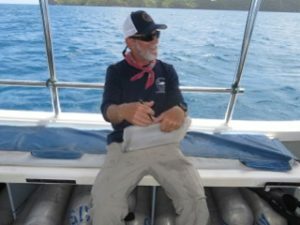 Bill Utley was supposed to arrive early in the evening of the 15th but got rerouted from his direct flight to Palau from Guam and had to go through Manila. I’ll have a photo of him before too long. 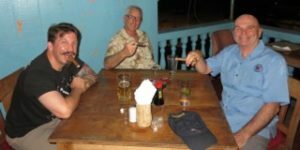 Bill is a retired government serviceman, knows underwater archaeology and a whole bunch of stuff about wooden ships and iron men. It will be very interesting having him onboard. Blake Boteler arrived last night but I fell asleep too early to see him. 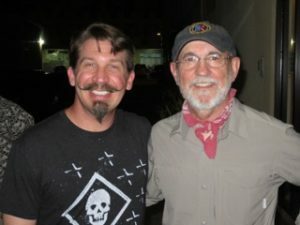 Two new people will be joining us for the last two weeks of the mission: Mike Sandler and Bruce Hottum. The rest of the alumni coming out on various days are Derek Abbey, Mickaila Johnston, Val Slocum, Bill Belcher (with two grad students in tow), Jolie Liston and of course Joe Maldangesang should be with us for the month starting today. Back out onto the water today. More later as it happens. It’s been two days on the water for us. 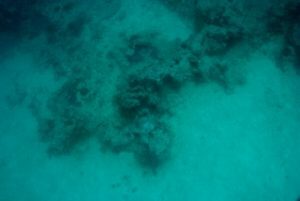 Yesterday we went out to the Western Reef to look at some anomalies that Mark Swank saw on some photographs and to do some wooden ship archaeologic work. Then we dove targets in Malakal Harbor. Today, we dove targets in Malakal Harbor. 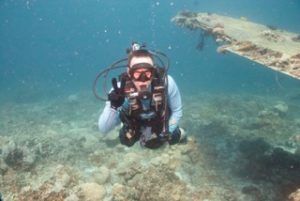 We could not find anything that looked man-made out on the Western Reef so whatever Mark saw, we couldn’t find. But it was a lovely boat ride out there. Pat Colin asked us to look at an area that an old wooden sailing vessel might have gone aground. We had Blake out with his metal detector to see if anything could be detected. It was a shallow area so we either snorkeled or walked the area. Of course, we found nothing but pretty fish and sand. Back to shore to pick up the Alien Finder. 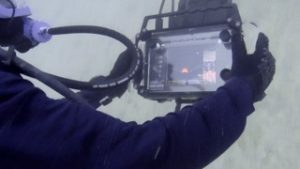 For those that remember the reports from the last two years, SIO and UDEL have both brought out Navigators: underwater man-portable sonar devices. It really allows you to find stuff in murky conditions which is pretty much all we have in Malakal Harbor. On a good day. Last year Mickaila got trained by Eric to use it. This year, Drew has taught Bert, Blake and me how to use it. Now we can be really efficient in our diving. Coupled with a new strategy for working for an individual team, we can spend less time acquiring a target. The proof is that today, we split into teams of two and dove into 11 targets today. But yesterday we knocked out a few targets while also getting trained. And yes, you guessed it, all we found was sand, rock and some coral. Drew found a pipe so at least he saw something man-made. Dan O’Brien stayed behind to do admin work for us and got us a reservation at our favorite Thai restaurant in town. As I said, today we knocked out 11 targets. These were all points of interest found by the SIO and UDEL AUVs. We had to put eyeballs on the area to confirm it was either ’The Jackpot’ or more ocean stuff. Tonight was a quick meal at Bem Ermii. 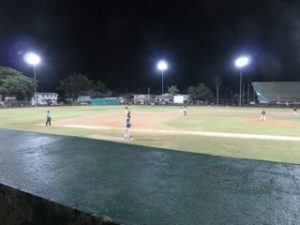 There was a ballgame about to start right behind the burger stand, but we went back to do some reviewing of case files. Tomorrow, we’re back on the water again. More targets to look at. Maybe we’ll hit the jackpot. You can’t win if you don’t play. One environmental note. The locals are saying it is a particularly cool winter this year. I actually felt a little chill in the air at dinner. A chill in the air in Palau. I can’t ever say I’ve been to Bem Ermii without sweating profusely. Today I needed a jacket! 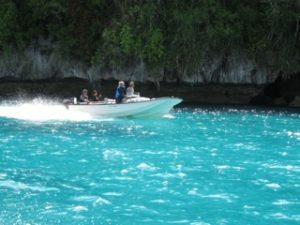 And Palau is in drought conditions. Water hours are sometimes in effect. There’s plenty of bottled water and we’re out in the field during daylight water hours. 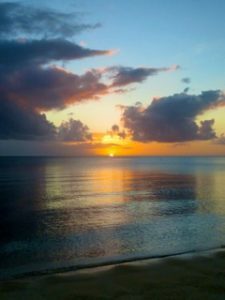 But it is odd that an island nation surrounded by a gazillion miles of ocean is short of water. Another great two days on the water. It’s not that we found anything that we’re looking for, but we certainly know where not to look now. So in the big scheme of things, if the airplanes we’re looking for are really in the harbor, the AUVs from SIO and UDEL have already collected the data to tell us where. 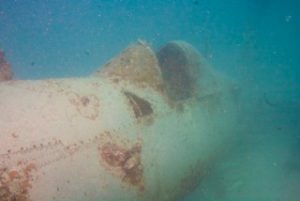 But it’s not like we’re getting pictures of the bottom and you can look at one and say ‘Yup, that’s a plane.’ Here’s what an image looks like, see below. Yes, there’s something there, but what is it really? At some point, you have to go down and look. This is where the art of interpretation (intelligence analysis) takes over. 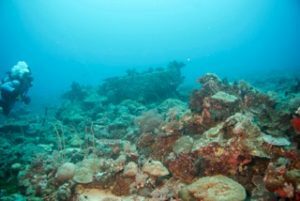 You have to prioritize the targets with your best guess as to what might be man-made and what is natural (coral, rock). Then you go look. But even the lowest priority target after analysis might be what you’re looking for. The best analogy I can think of is you’ve lost your car keys in your house. You know they will be in the last place you look. Derek arrived at 0100 on the 20th. After a quick nap, he joined us for Pancake Sunday! 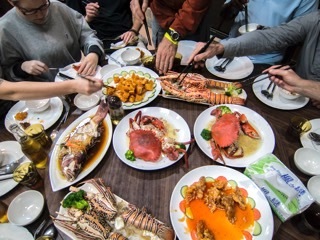 For those of you who’ve been reading these for a bit, you know that this BentProp tradition comes and goes in terms of how many of these meals we do. But the meal is always the same: pancakes made from Krusteaz pancake mix, club soda (thank you Rebecca) blueberries, fried in bacon grease from the bacon served alongside. We always seem to have guests and it’s always a good relaxing time. Then we went to work. We went to The Taj for Indian food tonight. Great as always. Dan took off early to pick up Mickaila at the airport. We saw him at the hotel and he is ready to go to work tomorrow. We are doing split ops for the first time tomorrow. Pat, Derek, Bert, and Bill will be heading to the jungle. Mickaila, Blake, Drew and I will be on the water. Dan is doing admin stuff for all of us. Then we’ll get together and share the details of what we did, then I’ll share with you. 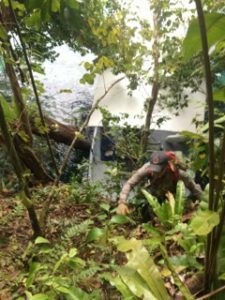 As I said in the last update, split ops occurred yesterday with four folks going into the jungle and four out on the water. 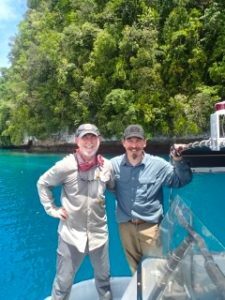 Derek led Pat, Bert and Bill up to Ngeremlengui to a known wreck site to a) introduce our new folks to an actual MIA site, b) introduce them to two of the three jungle types we deal with in Palau, c) and to check on the condition and status of this site. It’s deep in the mangroves so we’re really not too worried, but you never know. The water folks, led by Mickaila and including Drew, Blake and me, dove on 8 targets after Mickaila got his warm-up dive in on the Jake. We found a few man-made things: pipes, barrels and the like but not the man-made things we’re looking for. We did see a really cool looking crocodile fish hanging out on one of the barrels. We went out to dinner and right at the end, Bill Belcher and his students showed up. 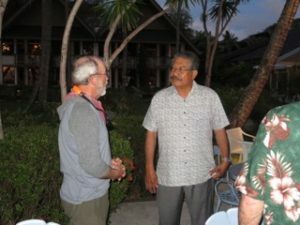 Bill is a professor now at The University of Hawaii. He used to be at JPAC which became DPAA. He’s come to work a site on land upon Police Hill. We turned in early as we were going to do another day of split ops. This time in three different directions. So now it’s the 22nd. After a group breakfast, we all headed out. Bill and students went up to Police Hill to dig in the dirt. 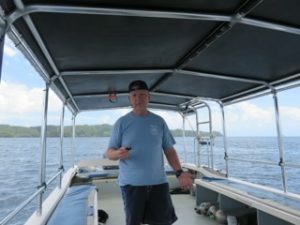 MJ (Mickaila), Derek, Bill, and Bert took a boat out and did more target identifications, eliminating more side scan sonar (sss) targets from our list to get eyeballs on. 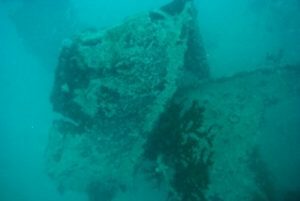 Drew, Blake and I went to Peleliu to further investigate a Marine amphibious landing craft that sank in about 75 feet of water. 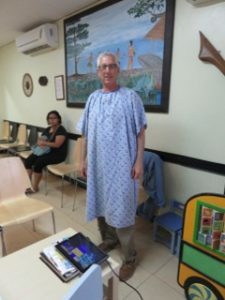 This site was discovered by Mark and Joe Maldangesang a number of years ago but Drew wanted to see it first hand for himself. So off we went. But first, Drew wanted to see what one looks like not on the bottom of the ocean. There are three locations on the island where you can easily see LVTs. 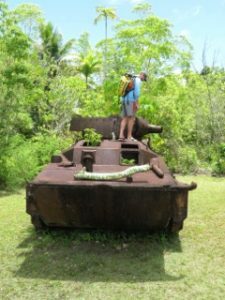 Des Matsutaro runs Peleliu Adventures Tour Company and took us to the sites. After our work was complete, we drifted north and took the opportunity to see pretty fish. We saw turtles, sharks, rays, barracuda (lots of these) and many many reef fish. We all met back at the hotel and went out for a group meal. Myles from Scripps is still here and he joined us. And that brings you up to speed. And I need to go to bed. 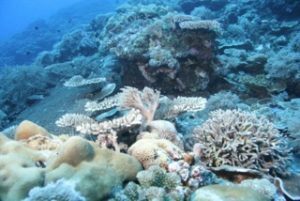 Tomorrow, we’ll split up again with some folks going to Police Hill, some diving on sss targets and one group doing a bit of recon work on a real tough coral jungle island, but that hasn’t happened yet. The 23rd was another split ops day. Bill Belcher, his students, and Bill Utley went up to Police Hill to continue working what we suspect is the execution site of a number of POWs and civilians. They made great progress towards finishing their investigation of the ‘L’ shaped trench. Derek and Pat did their recon work on one of the other islands and it sounded treacherous. 100-foot sheer cliffs, dead-end valleys with steep walls. Steep inclines everywhere. Not for the faint of heart. They did not see any airplane pieces. 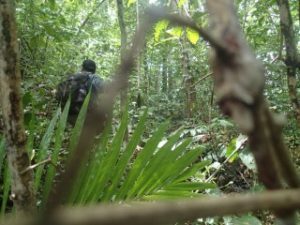 But if they were 50 feet off from where they wanted to be, the jungle would obscure everything. Even though the jungle is a lot drier this year, it is still just as thick. The drought hasn’t changed that. Mickaila, Drew, Bert, Blake and I were back out in the harbor dropping on sss targets. The 24th was saner. Just Police Hill and harbor targets. Bill and crew finished up the ‘L’ shaped trench and investigated some other spots. The boat people dropped in on 12 targets using the Alien Finder. Bupkis. Drew is leaving tonight, the 24th, so we’re having a goodbye dinner for him at Palm Bay Bistro. Tomorrow the 25th is going to be a split day as well. Bill and crew, back on the hill. For the rest of us, a training day. 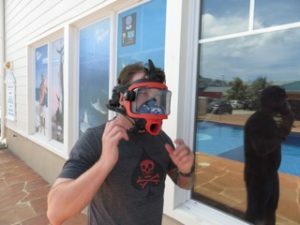 Mickaila brought out full face scuba masks with in-water communication systems for us to work with and he’s going to teach us how to use them. Pat will train everyone on our oxygen systems. 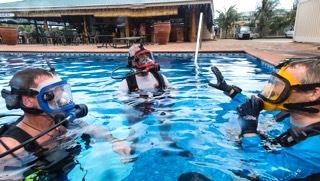 And for those that don’t have a Nitrox qual in scuba, we will try to get that training in as well. Palau and rest of Pacific are in a strong El Nino seasonal weather pattern right now that. This accounts for the cooler weather/ colder water, and drought, leading to the drier jungle. 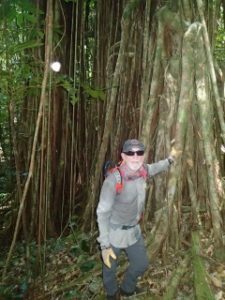 You may have noticed that there are many brown trees in the jungle area. This is due to the El Nino drought. Mean sea level in western Pacific also about 6-9″ lower than normal. El Nino is characterized by weakened easterly trade winds and can persist for up to a year or so. 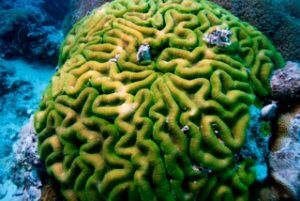 Next year, if a La Nina swings in, expect opposite with coral bleaching impacts due to warmer water, and more rain. Next, a question has come up about our eating habits. Do we live in tents and cook our own food at night in the bush? I think the two photos answer those questions sufficiently. The 25th was a training day. We had breakfast in the Ready Room then walked across the hall for our lessons. Mickaila gave us the classroom training on the OTS full face mask setups. We watched videos, played with the gear and had great discussions of the whats, whys, and wherefores. After that, we opened the D.A.N. Emergency Oxygen Case and reviewed in depth the use of the O2 system. We also watched all of the D.A.N. training videos to make sure we got full knowledge. Then we all took the written exam, orally. As a team. Cooperate to graduate. We also opened our Medical Kit and did training with that as well. Then off to the pool for our first use of the full face mask setups. Four of us did the pool training: Derek, Bert, Blake, and Flip. Everyone else will do their pool training later. 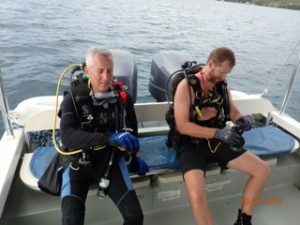 Derek and Bert are going to be the first to leave Palau this year so they are the first to get all the training. 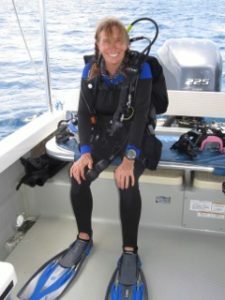 Tomorrow, Mickaila will supervise their first open water dives with the masks. After he is satisfied, then Blake and I will receive the open water training. Everyone who tried the full face mask REALLY liked it. Many benefits. No real downside. Out for a farewell dinner for Bill, Courtney, and Alaina. They leave at oh-dark-thirty in the morning. That’s early for folks that need to look at a watch. Tomorrow will be a water day. I’ll let you know what happened after it’s happened. If you received multiple copies of Update 6, sorry. As is usual out here, my laptop is acting up. Sometimes it sends just fine. Sometimes it acts as if it hasn’t. I actually typed this update last night and saved it. The next morning, most of it was gone and I had to start over. Just typical technology issues for me out here. We had some people on the boat looking at targets. 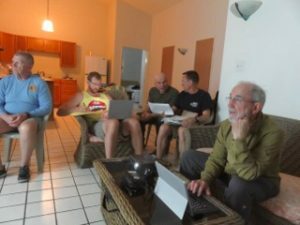 We had some folks back in the hotel researching Side Scan Sonar (SSS) targets and doing admin work. We had some folks recuperating while doing the last sentence (Don’t worry love ones, nothing serious. As I was told, if I got hurt getting a message, it’s self-inflicted and my own fault.) But we are making progress on what we are supposed to be doing even though we don’t have anything from today to show for it. Sunday is going to be a slightly later start. First off, another pancake breakfast. 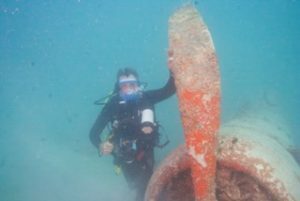 Then Ted Mikita will be giving us a brief on what he has discovered about his cousin B-24 that went down here. Then we’ll head out for the day’s festivities. LATE BREAKING NEWS!!! Our coffee pot died this morning. Nothing would revive it. This is a true crisis. When Dan went to the restaurant to get some coffee for our troops, the coffee pot came back to life. On its own. So, still not finding much new stuff. Dropped in on some targets but came up with a dry hole. So, a little entertainment with an oldie, but goodie. Bad visibility, but still a great wreck. And it is all still there. 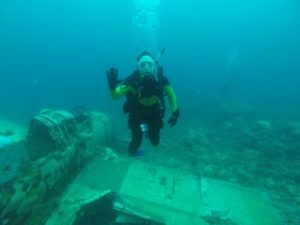 Half our team has never seen it so we thought we would show them what a full airplane looks like underwater. So that is what we did yesterday, the 28th. Today the 29th, we dropped in on four sss targets. 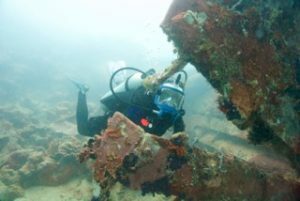 We actually found some things man-made: an anchor, mooring lines, an old four-cylinder boat engine. And nothing else. But again, at least we know where not to look for MIAs. Our first new member left last night. Bert Garrison, from Ohio, back row, second from right, departed last night. Bill Utley, our other first two weeks new member, from Maryland, leaves tonight. He is in the front row, second from the left. Their replacements for the second two weeks are Mike Sandler, who is already here being a tourist and scuba diving, and Bruce Hottum who comes in at 0105 on April 1st. More to follow once I get action photos of them. 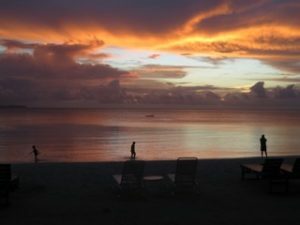 Where in the world these days can you yuck it up with a former head of state while watching a beautiful sunset? We were out on the water today, the 29th. Bill was running the topside operation since he has to fly out tonight to head back home. We eliminated a number of targets today setting a new quantity record: 13 by MJs count. Of course two of the targets we could snorkel and see what was done there but we crossed them off the list. We initiated a water rescue today of a lost flamingo. Derek says we found a man-made object with wings. It floated out of Sams Tours harbor all on its own and we caught up to it halfway across Malakal Harbor. We saved it from a fate worse than deflation. The flamingo was handed off to Sam’s boat and I’m sure it’s back with its rightful owner. 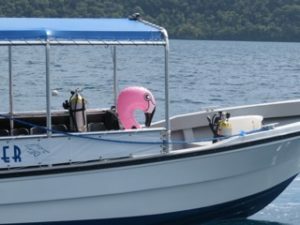 And shouldn’t every dive boat have its own flamingo? Since Bill is leaving tonight he gets to choose where to eat. He chose Bem Ermii’s and we had the added benefit of a floor show: a night baseball game! We left at the bottom of the 3rd inning and it was 14 to 1. It was going to be a long game. Mike Sandler officially switched from vacation mode to BentProp mode tonight. He will join us on his first outing with us tomorrow. Which we are going to get a later start than normal. Our colleagues from UDEL/SIO have given us more sss targets to go after. We will need to prioritize and come up with a working plan. And since we have two weeks yet to go, weÂ do not have to stay up until the wee hours of the morning to figure it out. Today, 01 April, is training day again. Some folks are getting their warm-ups in the full face scuba masks (Pat, Dan, Val, Mike, Bruce) and others are completing their Nitrox qualifications (Pat, Dan, Val, Derek, Blake). And a couple of folks are getting their warm-up dives in (Mike and Bruce). I get to get caught up in getting you some news. Our final member of this year’s mission arrived around 0040 on 01 April: Bruce Hottum. 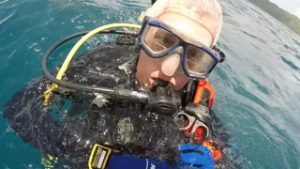 Val Slocum arrived on the 30th and got in a day of diving already. Bruce is already masked and Nitrox qualified, but he’s attending Mickaila’s warm-up session and will be one of the folks doing a warm-up dive. 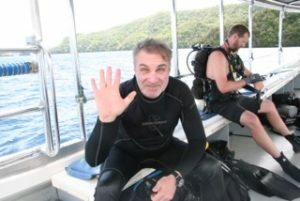 The other warm-up diver is Mike Sandler who got here early to be a tourist diver but developed an ear problem. I think he’s over it and so it’s time to get him in the water. The past few days have been simply getting onto as many sss targets that we can and see what’s down there. A question from the audience was asked about how all this really happens. So, sit back and let me tell you a story. Back in the day, we would figure out through archival research where an airplane was supposed to have gone down. 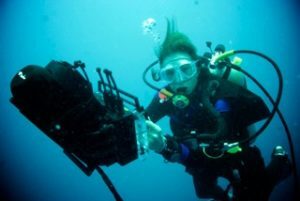 Then we would send in a mass of scuba divers in the area and do an eyeball search. We could spend days and days trying to get on one target. 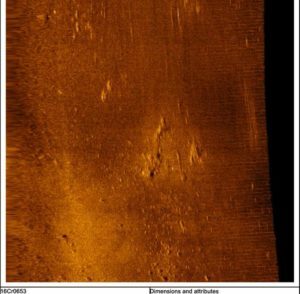 We moved into the 20th century when we started using a towed side scan sonar unit behind a boat. 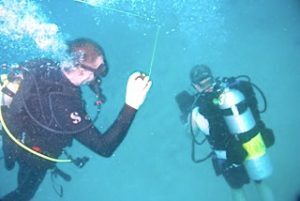 The Navy Divers we met a long time ago gave us some training on how to do it and when we got our own unit, we started to ‘beam until we screamed’. 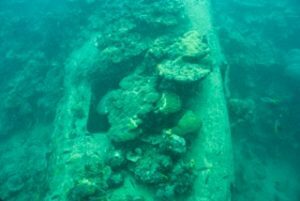 So we shifted from mass amounts of scuba divers looking to see what’s on the bottom to a group of surface support folks spending hours upon mind-numbing hours towing an underwater sss unit until we found something. 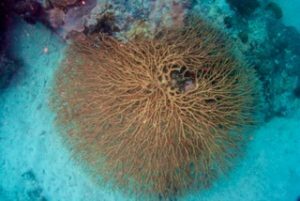 Of course, reading an sss display is more art for us than science so we probably missed a whole lot and needlessly dived on things that everyone would know was a rock. But for the sake of argument, let’s say we actually found something we wanted to investigate. We were using a basic sss unit. It tracked where it was via a lat/long. 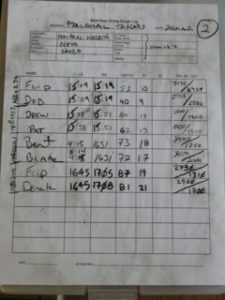 We had to calculate an offset from the unit (sometimes as much as 200 feet behind the boat) to the GPS antenna on the boat, and use that as the coordinates of our target. Remember, any time you do the math, you can make a mistake. 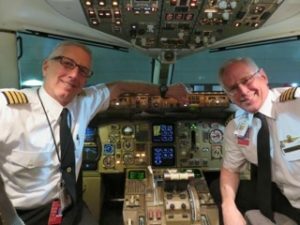 The first lesson I ever was taught in aviation. We would drop a weighted fishing line down to the bottom to give us a chance of actually getting down to those coordinates. 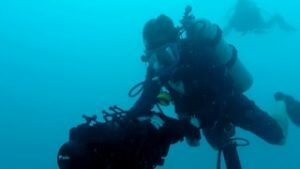 Then we would dive those coordinates in generally poor visibility conditions. As you can see, we were introducing a lot of variables into the program on our own. 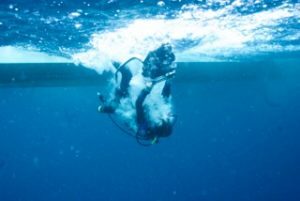 Once again, we would send down a mass of divers to try and locate something and say, ‘yup, that was our sss target. And again, we could spend days working just one target area. 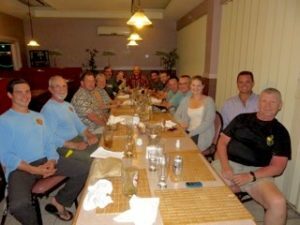 Fast forward a couple of years and our meeting both Scripps Institution of Oceanography and the University of Delaware during one of their science missions to Palau. They showed us what technology could do for us, then they offered to do some work with us. 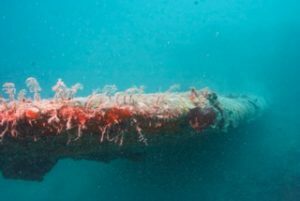 They would use their autonomous underwater vehicles (AUV) and hull mounted sensors to scan the bottom to collect target data. They would also, time permitting, dive the object. They introduced us to Shark Technologies’ Navigator man-portable underwater sonar. 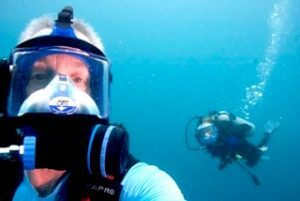 That allows you to ’see’ objects on the ocean bottom while diving. Poor visibility is no longer a search hinderance. 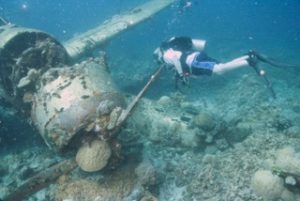 If an object was found that was an aircraft, we, BentProp, would then characterize the crash site to determine what kind of aircraft it was, which aircraft it was and whether or not MIAs were associated with it. This upgrade in technology was a game changer. 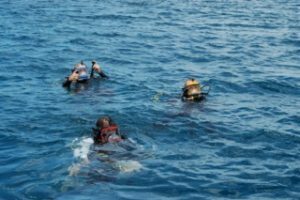 But we were dependent on SIO/UDEL for nightly transfer of accurate target information to us so that we could make some dives the next day to see what was on the bottom. Not efficient for any of our organizations. A couple of years progressed and now our methodology has changed again. SIO/UDEL were out here from 1-15 March. They did what they do with technology and developed a lengthy target list from the sss data. We have come to the conclusion that if the airplanes we are looking for are really in the harbor, then the target set from the sss data shows them. And if the target set has them, then no matter what the sss picture looks like, we have to eventually dive the site. In past years, we’ve all looked at a target and said, ‘no, that’s nothing’ and it was something. And of course the converse is true: ‘that’s something’ and it was nothing. So which is the airplane and which is the rock pile? I believe the above image is that of the sss target, but from a different angle. So you can see it’s not like looking at a photo of an airplane. There is a bit of art, and luck, to all of this. 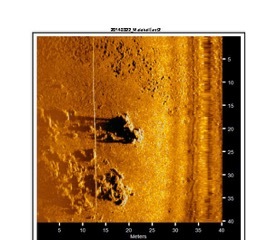 The sss image has output data from the AUV. The AUV gives us accurate lat/long in order to find the object again. And depth in order to plan our lives. Our klump is now a cinder block with stout nylon line. It goes down fast without much drift. So we drive the boat until we are exactly over the lat/long, drop the block and then dive the line. The block has been within 10 feet of the target every time. In addition, SIO and UDEL have entrusted into our hands their Navigator units so we can conduct our own searches irrespective of visibility on the bottom. 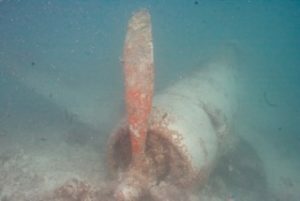 April 2nd is a split ops day: some into the mangroves looking for a Corsair and the rest out on the water. But for these stories, you will have to wait until another day. Hope all is well with you on your side of the pond. 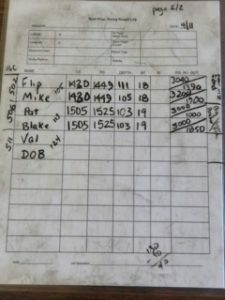 Once a dive is done, we log our dive and what we found. An annotated master list is kept so we can keep track of what we’ve done. First off, I hit send earlier when I just meant to close the window of the email. The stats were wrong and I had not finished the last thoughts. It’s all Mickaila’s fault. 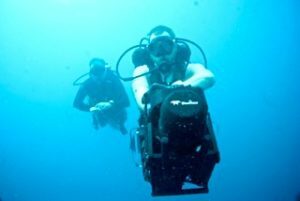 He made me dive air today instead of Nitrox. Back to our story. 79 FSW average for all targets in our list, checked off and yet to go. Yesterday, April 2nd, the split ops day, revealed nothing for finding any airplanes. 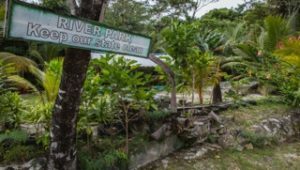 The mangrove people came across old milkfish farms, taro patches and a warehouse being expanded into the mangrove. 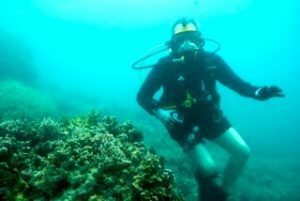 The divers saw rocks, coral, sand and a fish. It seems as if our land targets are drying up. Bruce and Dan interviewed Kent earlier today. He told Bruce last November about a plane wreck he saw while hunting 6-8 years ago. But he can’t quite remember where, other than the south end of the island. It’s a big island. And he’s busy at work seven days a week since it is high tourist season. So we’ll have to wait until later in the year to see if he can find it again. The mission has just under two weeks to go. The pace tends to pick up a little bit and we expect to get more leads while we’re here. It always happens that way. So hopefully we get to hike the jungle before we go. Yesterday, 04 April, nothing of import happened. We were all out on the boat and crossed off 10 targets from our list. 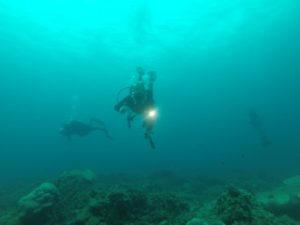 We had one deep dive to 128 feet that looked promising. It was a rock. 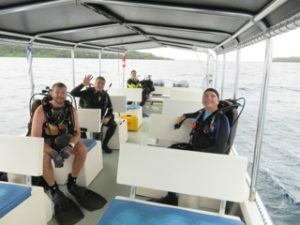 The rest of our dives were above 80 feet. 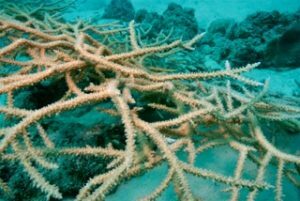 We found some large size monofilament fishing line wrapped on some plate coral, but other than that, I don’t think we found anything man-made. 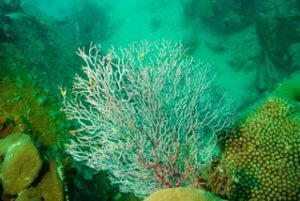 I haven’t taken my underwater camera underwater in a few days so I don’t even have out of focus pictures of fish to show you. There are a lot more photos from other folks at the Facebook page for BentProp. Take a peek as various social media will be the platforms in the future for staying in touch with the field missions. 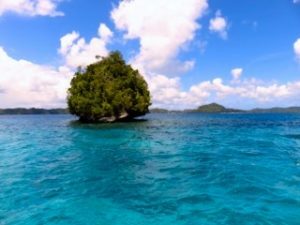 A couple of updates ago I gave you the high-level strategic reasons why we’ve been successful out in Palau, checking off items on our target list. Now let’s get down to the tactical level: what we do on a daily basis that makes this work like a fine Swiss clock. But first news from yesterday, April 5th. We didn’t find anything worthy of mention. But even though we only worked a tad over half a day, we knocked off 8 targets from our list. Back to my story. The day starts off with coffee. Lots of it. Having two coffee pots is new for us. Our older black one stopped working on Easter Sunday morning. Deader than a doornail. Dan went next door to borrow a carafe of coffee from Palm Bistro and miraculously, the coffee maker came back to life on its own when the new coffee maker showed up. We check drinking water supplies every morning to make sure we can make coffee not only today but tomorrow as well. Water reorders go in every morning just in case during this drought time. 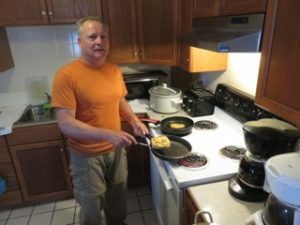 Somebody ‘volunteers’ to make breakfast every day. I say “make” because some folks just open the cabinet doors and point to cereal boxes, others take them out and put them onto the table and others cook. This morning, new guy Bruce is showing us his French Toast making skills. But don’t tell his wife. She thinks he doesn’t cook. 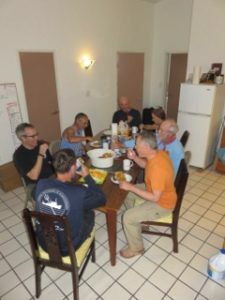 We eat as a group and Pat does a mental health and wellness check of everyone. He (or she) who cooks, does not clean. And clean the ready room must be since Dan and I live here for the mission. Then it’s time to brief. Sometimes it is a short brief, and sometimes it is a long brief. Depends on whether or not we have to give background for a particular target. 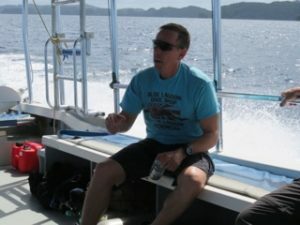 Since Mickaila is our water mission leader, he conducts the briefs for our diving days. Our first projector also went south so now we have a nice widescreen projector. Perfect for our next movie, “Flying Leathernecks”. 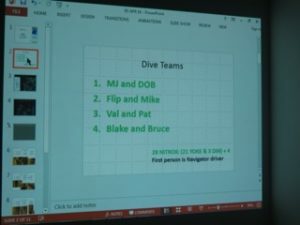 We use the sss data gathered by SIO and UDEL to give an idea as to what each dive team is looking for. For background information, we might even review reports generated at the time of the aircraft loss. 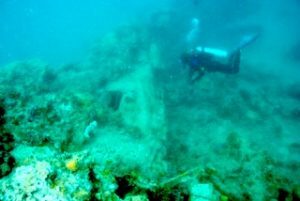 One of the reasons is to let new people read the info and maybe they read a different interpretation into it and come up with a different solution to finding a wreck site. Once the briefing is done, we gather up our stuff at the hotel and run a hotel pre-departure checklist. Hopefully, we do not leave anything behind that we need. 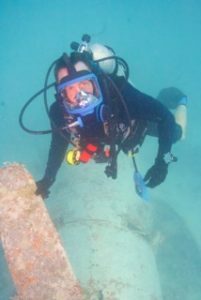 At the marina, we gather up all our scuba stuff, load the boat, set up our first tanks and run a pre-push off the dock checklist. Hopefully, we do not leave anything behind that we need. 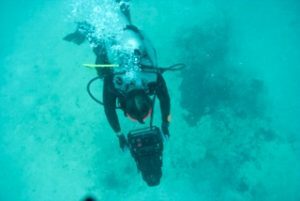 We drop the klump (cinder block, the long floating line attached to a buoy), suit up the first divers and run a daily mission brief that covers a number of safety items including in-water emergency procedures. 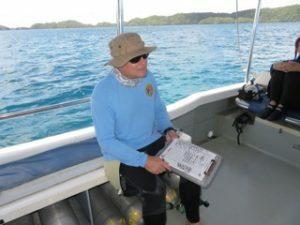 Then prior to each dive, we run a dive specific checklist. Hopefully, we do not leave anything behind that we need. Repeat process until all targets have been looked at, or until we have to meet our 5 pm return to the dock time. As you can tell, it could be a very full day. 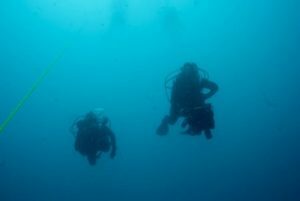 With three sets of divers and a full day, we can easily interrogate 12 targets without getting winded. And that is what we are doing out here on a daily basis. Hope all is well where you are. Until the next report. This morning, new guy Bruce is showing us his French Toast making skills. But don’t tell his wife. She thinks he doesn’t cook. Bruce running the deck including mission brief and dive checklist. After the dive every diver gets 10 minutes quiet, no work time to talk about the dive, and sit and do nothing. I seem to be a tad behind in the updates. We’ve been diving up a storm and I’ve been going to bed early. So, let me catch you up on the important things. In the past few days, we have not found anything new. A few man-made objects de ship, but nothing else. But we have a really good set of targets for tomorrow. 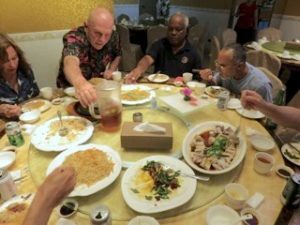 We found a new Chinese Restaurant a few nights ago. Well, new to us. Joe knows the owner. She came here and was a farmer. Then she moved into sea cucumbers: catching and selling around the world. Now she also owns this restaurant. Excellent food. Not much English is spoken. We played food roulette. 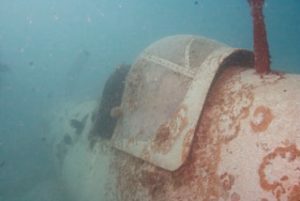 The next day we took a short time off from diving the harbor to dive on the B24 BentProp found a number of years ago. 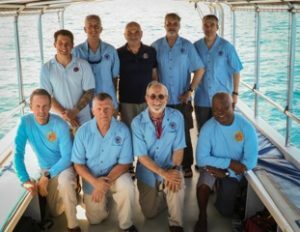 You may recall that Wil Hylton wrote a book about the crew and their families, “Vanished”, Anderson Cooper did a 60 Minutes piece on it, and Casey Doyle, a BentProp team member escorted his grandfather, Jimmy Doyle, home once he was recovered. And the documentary, “Last Flight Home” showed Tommy Doyle diving on his father’s airplane. It appears no one has. 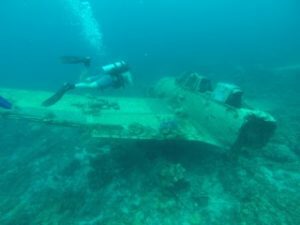 It also was an opportunity for some training as a number of folks haven’t seen an underwater crash site and most of the team hadn’t seen the B24 at all. We beat feet back to port and Pat and myself were dropped off. 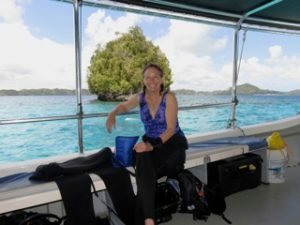 Each year Pat gives a medical lecture on infectious diseases that do or could, affect Palau. I was brought in as a visual aid. Each year, I get a heat rash on my back from my wetsuit. 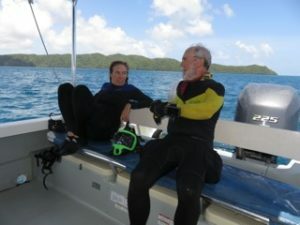 That’s the real reason I switched to science garb for diving: trying not to irritate my back any more than it is. But for Pat’s presentation, my back was perfect. Pat was explaining that some of the nasty diseases out there could have a rash that looked just like mine. Then he showed them my back, but not my backside, if you know what I mean. Zika is one of those diseases that has the rash. I guess the looks on the audience were a bit trepidatious until Pat promised them that I do not have Zika. Jolie Liston is the final alumni member to show up in Palau this year. 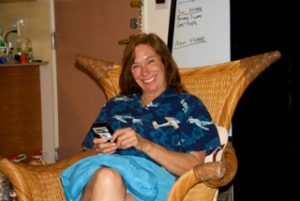 She is our past resident in-country archaeologist who is smart as a whip on ancient Palauan stuff. She goes into the jungle with us as we go places most folks never go. Although this year seems to be mostly water, we really do want to get some hiking and searching in. Tomorrow, Saturday the 9th, Jolie is taking Bruce up for a survey tour of the area we call Police Hill. 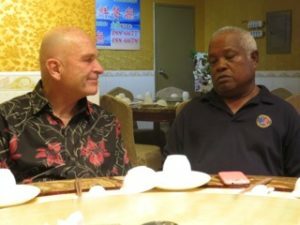 I was giving marching orders to reduce my wardrobe out here in Palau. My teammates are helping me. They said a certain Hawaiian shirt had to go. So it did. Now they’re going through my closet out and drawers ‘helping’ me cull the herd. It is painful. That’s the news as I know it. 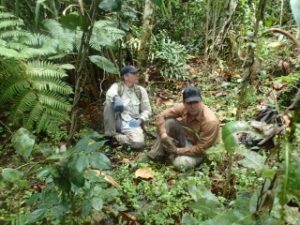 Saturday is split ops with water and land, and then all of us on land for sunset in the jungle. But for that story, you’ll have to wait. As I write this Monday morning the 11th, the smell of cooking chorizo is wafting through the air. It’s Mickaila’s last day here and he is making us his famous Mexican burrito breakfast. He says it’s better with adobo leftovers but he only has so much to work with here. We’ve been diving up a storm the past few days. 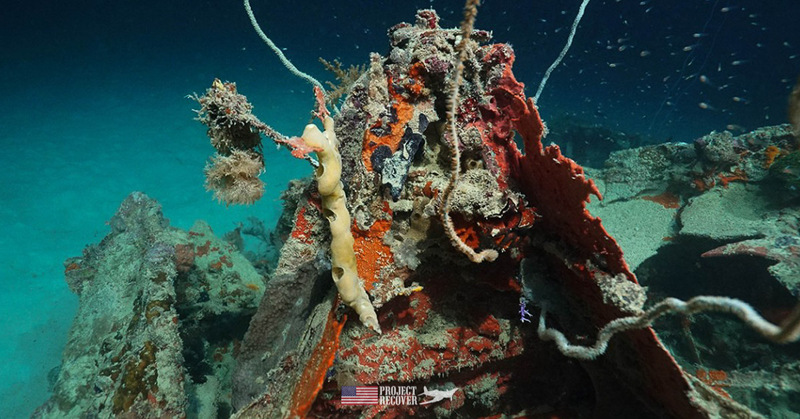 We’ve gone over 100 man-hours underwater, knocked off 161 targets, found one ship, some harbor trash but no airplanes. And consumed three fruit bats. 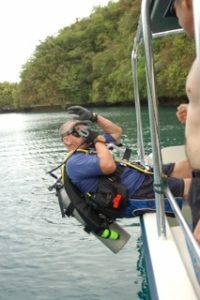 This was a challenging dive. Low visibility, deep and three separate large hunks of stuff on the bottom. 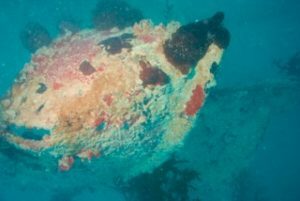 We did not get to see the main piece of the hull of the ship but did see the stern section, vent stacks and stuff. Jolie and Bruce spent another day upon Police Hill. Utilizing War Crime Trial testimony, Bruce has come up with another possible site where the missing POWs could be. We will not have time to do any test pits, but that is certainly in the mix for another mission out here. MJ flies out tonight at 0230. 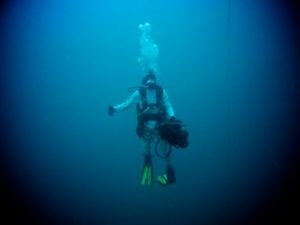 This is my last day diving. Jolie leaves the same morning I do. The mission is winding down. And that brings you up to speed. Back end of a ship that was blown off. First, a housekeeping item. 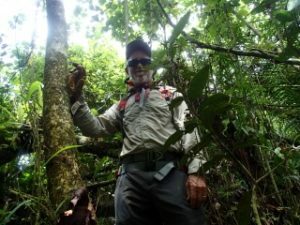 If you are missing any in my series of updates from the field, and care to read them, they are all posted at www.projectrecover.org. So stick a fork in me, I’m done. 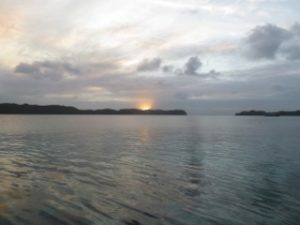 I am in the middle of packing out and starting the trek home tonight with a 0445 departure out of Palau. If all goes well, I’ll be home by 1530 the same day. Today, Bruce Hottom went to give a couple of dental lectures to some local practitioners. He has a morning and afternoon lecture scheduled. Jolie Liston is also leaving tonight and she’s in meetings today as well. Pat has been writing reports for the mission closeout and he leaves tomorrow night. 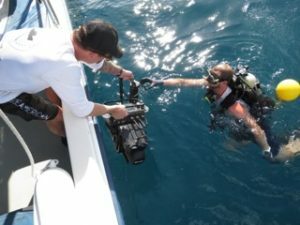 He took an extra day off from diving to make sure his end of the reportage is done without haste. That leaves Dan, Val, Blake, and Mike on the boat, still diving targets. 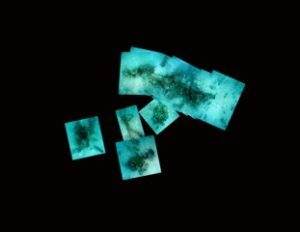 One of the sss images they are going after today is the best one we’ve seen, looking like an airplane outline. Since we haven’t gotten a phone call from them, it’s probably a cluster of rocks. I was given marching orders to cull my clothing collection out here. Val and Jolie gleefully helped and joyously sent photos to Rebecca of the pile of items to be disposed of. And just for good measure, I moved some items to the discard pile as well. I think I will still have enough stuff to get me through the next mission, but I’m sure something from my closet is bound for banishment to this tropical paradise. If something happens between now and the official end of the mission, it will hopefully show up at the website. Going forward, we will most likely just send out email blasts to the BentProp Project’s contact list automatically when the website has been updated with news. If you would like to be on that list, please go to the website and sign up. And there you have it. 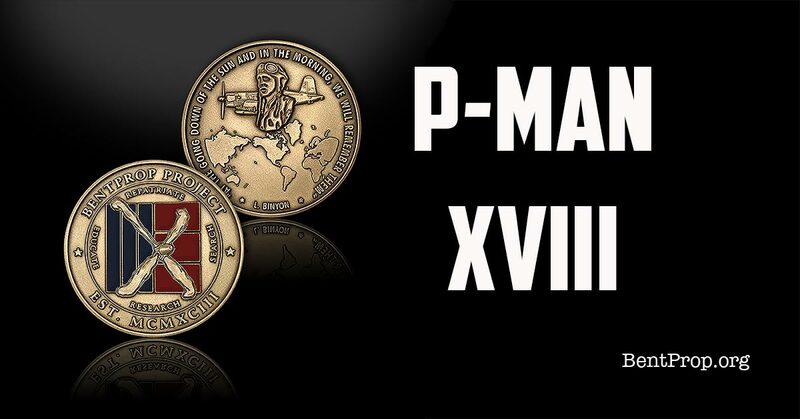 P-MAN XVIII is coming to a close. But it did not take long. I have a P-MAN XVIV file already set up with emails in it already. You really can get by with Navy showers every day for a month, and not be in the Navy. Hand sanitizer smells good too. Whiteboards can lose their erasing qualities even with dry erase markers. Who knew? It is possible NOT to flood an underwater camera. Or lose it. My biggest fear coming out here this year. At some point in your life, asking for a really firm massage is counter-productive. 0445 flight is early no matter how you slice it.